I found out this week that my diabetes has completely gone away! Phew. I also found out this week that I have to give up dairy, nuts, soy, and eggs, because dear little Darcy is apparently allergic to some or all of them. I get to add them back in little by little to see what I can and can't eat. So, that should add a fun new dimension to my recipe selections! This week I made two more recipes that I'll be reviewing at some point - Citrus Fish with Bell Pepper Couscous and Turkey Breast with Mexican Squash. I'm telling you, last month's issue of Every Day with Rachael Ray was chock full of recipes that look really good to me. I haven't even looked at my new issue because I'm still all caught up in the last one! Jen of Beantown Baker used Rachael Ray's recipe for Mac and Cheese with Cauliflower to create her own dairy free version. Cook. Craft. Enjoy. features an adaptation of Rachael Ray's Crispy Noodle Salad with Sweet and Sour Dressing. Tina at Carrots and Cake made one of my favorite Rachael Ray burger creations - Spanikopita Burgers. Mrs. U at Making a House a Home made a recipe everyone should try: Vicki's Favorite Chicken with Grapes and Couscous. 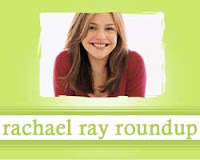 Tim Ryan informs us that Rachael Ray's talk show will be filming for a week in Maui this June. The Courier-Post tested Rachael Ray's recipes to see if they could be made in under 30 minutes. Tiffany at Feed the Moose tried Smoky Orange Barbecue Chicken Sandwiches and went through quite an ordeal! I know! The magazines have been really great. That is great news about the diabetes, sorry about the food allergies. Hopefully you can narrow it down & she will outgrow whatever it is. The turkey breast with mexican squash sounds delicious. Can't wait to hear what you think. I'm having a great time looking around your blog! It's great!